Do you believe that a mere twenty minutes can change your day? That a simple, intentional moment could put your mind and body on the track for a fruitful, grateful, and rewarding day – everyday? Well, it’s true! Starting your day with yoga has helped to empower and focus people all over the world. In fact, most dedicated yogis swear by a quiet morning routine of warm water, mediation, and gentle practice on a fresh mind and empty stomach. It’s not so hard to imagine why this might be. Our morning sets the tone for the entire day and a dedicated practice – even if only twenty minutes long – can help to refocus our minds on strength, focus, flexibility, and serenity. The mind is primed from the beginning to react with care and intention, release tension, and seek out the good in others. What a transformation this could be for the average day? 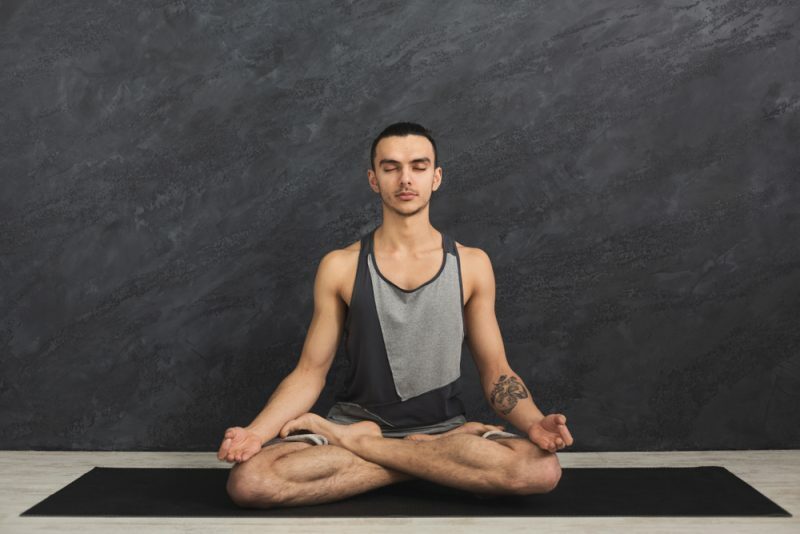 A yoga morning practice could reduce the amount of stress at work, irritation at “set-backs,” feelings of worry and anxiety, and brighten our overall experience of life. We might find it easier to connect to others and solve problems with more creativity. We might breathe easier and be happier. Adding to a hectic morning routine can be daunting. For many individuals, mornings are rushed and complicated events whether you fight the morning traffic or wrangle kids off to school. Poor sleep can make getting up even earlier sound like a terrible idea – especially when you are a beginner. The truth is, however, that by reworking your mornings to include this twenty-minute sequence, you will squash fatigue and depression, enjoy healthier sleep patterns, and glide through your days with ease. Ready to jump on the morning yoga kick? Here’s a simple, rejuvenating, and quick twenty-minute beginner’s sequence to start your day right. Rise up to meet the day by starting in mountain pose. Stand tall with your feet together, shoulders back, neck straight, and chin tucked slightly towards your chest. Hang your arms by your side, shoulders down, and palms facing out in front of you. Engage your thigh muscles, lift your knee caps, and image an invisible line connecting your pelvis to the top of your head. Complete 3-5 breath cycles here. After gaining stability and focus in mountain pose, we will move to forward bend. Take a deep breath in. On the exhale, swoop your arms to your sides, bend slowly downward, and come into forward fold position. Touch your toes, shins, or knees, depending on what is comfortable for your body. You can grasp your elbows and allow your head to hang free. Take a few breaths here in forward fold. Raise up to mountain pose again, but swoop your hands over head. Take a deep breath in, the exhale and dive back into forward fold. Repeat 3-5 times. Rise back up to mountain pose to take on Warrior I. On an exhale, step your feet about 3-4 feet apart. Lift your arms above your head, parallel to each other. Draw your shoulders down to the coccyx and avoid the temptation to raise them towards your ears. Turn the right foot out 90 degrees to the right, and the left foot in 45-60 degrees to the right. 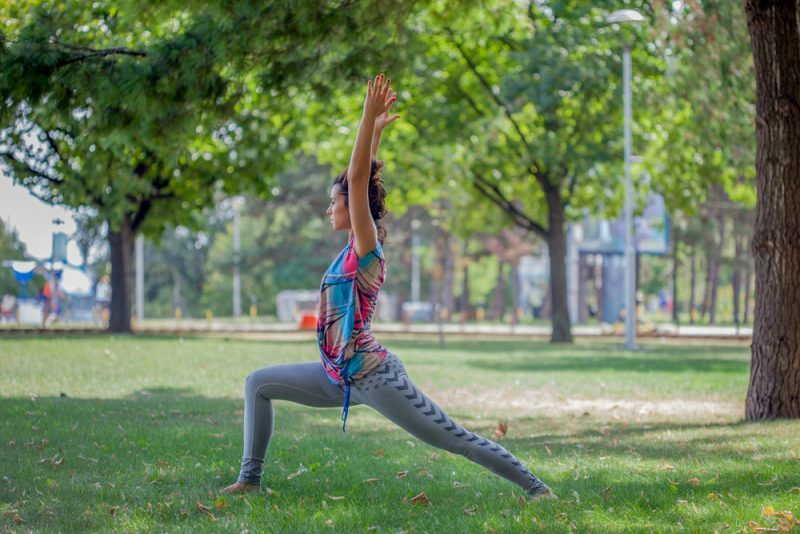 Exhale and turn your hips forward, allowing you to face the same direction as your right foot. Square your hips and strengthen your stance. Then slowly bend the right knee and sink into a strong Warrior I. Breathe deeply and slowly for about one minute. Repeat on the opposite side. Transition from Warrior I to Warrior II to deepen your strength and take on the day. Return to a neutral standing pose. Similarly, on an exhale, step your feet about 3-4 feet apart. Raise your arms and extend them out to the sides, parallel to the floor. Reach through your fingers, visualizing them extending beyond. With your heels on the same line, turn your right foot out to the right slightly and the left foot to the left 90 degrees. Bend the left knee over the left ankle while pressing into the right heel for stability. If possible, bend the left leg until it is parallel to the ground. Slightly stretch the left arm forward without moving the torso forward. Rest here for several breath cycles, or up to a minute, then repeat on the right side. Next we move to triangle to help us open up and embrace the day. Return again to mountain pose, then step your feet out 3-4 feet apart. Stretch your arms out to your sides, parallel to the floor below you. Turn your left foot slightly inwards, then position your right foot at a 90 degree angle to the left, along a similar line. On an exhale, move your torso over your right hip. Be sure to move from the hip, not the waist. Allow your right hand to fall at the shin, ankle, or floor next to the right foot and bring the left arm straight up overhead. Gaze up at your left thumb and rest here for 3-5 breath cycles. Repeat on the opposite side. No yoga practice would be complete without Downward Dog. Gain perspective, flush the brain with fresh blood, and strengthen your limbs. Come to the floors on hands and knees, similar to the tabletop position. With hands firmly planted and toes on the ground, stretch the knees to come to a downward dog position. Start with the knees slightly bent and heels off the ground, then exhale and slowly straighten the legs bringing the feet fully to the ground if possible. Pump your calves, stretch, or bend in whatever way feels good for your body. Rest here for a few breath cycles, about one or two minutes. After a stimulating Downward Dog, we will head to the floor to open the chest. It’s time to get flat on your map. Lie down with legs together and feet pointing towards the wall behind you and flat on the ground. Place your hands below your shoulders and spread your fingers to create a stable foundation. Inhale, straighten your arms and lift your chest. Meanwhile, be sure to keep your legs and pubic bone firmly on the ground. Open the chest further by reaching the shoulder blades back towards the spine. Take 3 to 5 deep and full breaths. On an exhale, release and gently lower back to the ground, laying the face on one side and resting for a few breaths. Repeat 2-3 times. Child’s pose is a great place to take a quick rest in our sequence, but also helps to focus and calm the mind. Stay here longer if you are expecting a stressful day or meeting ahead. Begin by kneeling on the floor with your knees spread slightly wider than your hips and your bottom resting on your heels. Exhale, slowly lowering your torso forward to rest in between your thighs. Place your forehead to the floor, and your arms down by your sides. Feel the stretch between your shoulder blades, then raise your arms up to rest outward in front of you to stretch the back and shoulders. Rest here for at least one minute. Fuel your day with joy by spending some time in happy baby, our next pose in the sequence. Happy baby instills a childlike sense of fun and release. Start by lying on your back, then exhale and bend your knees into your belly. Hold the outsides of your feet or use a strap. Open your knees and pull them towards your shoulders, like a little baby would. Keep your ankles in line with your knees so as not to overextend them. Push your feet into your hands for resistance and to engage the muscles. You may choose to rest here or sway back and forth to massage the back. Savasana is our place to rest and release, closing our practice and preparing our minds for the next step. Lay flat on your back with your legs extended. Release any tension in your muscles and allow your feet to turn out. Pull your shoulders down away from your ears and allow your arms to lay comfortably by your sides or on your stomach. Gently by your sides with palms facing upwards. Rest here for 3 minutes. While we usually end our sequences with savanna, in your morning practice it can be helpful to spend some time in Lotus before heading on to the rest of your day. Use this time in Lotus to focus your mind, tune into your intuition, and meditate on the kind of day you want to have. This provides a space for centered intention. Sit comfortably on the floor with your legs extended in front of you. Exhale, bringing your right foot in and place it on top of your left thigh. Then slide your left leg in and place the left foot on top of your right thigh. With palms facing upwards, place hands on knees and join the tips of your index finger and thumb. Straighten your spine and reach your head up to the sky. This is a good time to practice pranayama or the 4-7-8 breath. The key to starting – and keeping – a morning practice is to set your goal, arrange a schedule that works for you, and stick to it. The first few days of starting any habit is the hardest, but soon it will be second nature. Create a special space dedicated to your morning routine if you don’t already have a space yet. Tell a friend or coworker about your decision to practice daily for added accountability. If you are a brand new yoga beginner, there is no better way to build confidence and progress your practice than by dedicating time every morning. You will be amazed at how quickly your body and mind changes with daily practice and will soon start reaping all the benefits of a regular yoga practice.